Don't underestimate the potential of pony beads. They come in lots of colors that lend themselves to fabulous color combinations. The availability and economy of pony beads makes them a popular choice for kids beads projects and craft projects. Because they have larger holes than most beads, they can be strung on yarn, leather, hemp and other thicker cords. The larger holes also make them perfect for hair braiding. Take a look at the fun color combinations that we came up with. 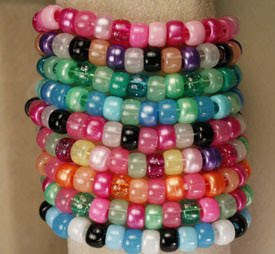 You can create friendship bracelets with pony beads that your friends will rave about.